Constant war drove Fazle, his wife and four children away from their home and farm in the Khyber region of Pakistan eight years ago. They loved their home, but with all the shooting and the armed extremist groups, he had to leave or endure the death, destruction and instability that comes with war. But seven years later, Fazle came back home, where I talked to him while visiting the area shortly after Easter, and he’s doing well. After getting six months of food aid, he got into a program that helped him set up a nursery. Now he’s earning about (US)$130 a month, four times his previous income. What’s happening to Fazle and the area where he lives is an important sign of progress for how humanitarian efforts can build peace and long-term stability in countries where conflict and hunger intertwine. In the year since I became the executive director of the United Nations World Food Programme, I’ve travelled to many of the areas with the highest food insecurity – Yemen, South Sudan, northeast Nigeria, Somalia. I have met many people who worry about food, but they often ask me first for help in creating peace. It’s easy to see why. Ten out of the 13 largest hunger crises in the world are conflict-driven, and 60 percent of the people in the world who are food insecure live in conflict zones. The price is highest on children. Hunger, malnutrition and poor health often lead to stunting – a phrase used to describe severely impaired growth in these young bodies. Three out of every four stunted children in the world lives in a conflict area. To make matters worse, in some of these areas, food has become a weapon of war. Access to food is blocked, in part to subjugate other combatants. And in some cases, it’s become a recruitment tool for extremist groups. But I believe food can be a weapon of peace. Food and other forms of humanitarian assistance is what has helped Fazle return home, to earn a living and provide hope for his children. 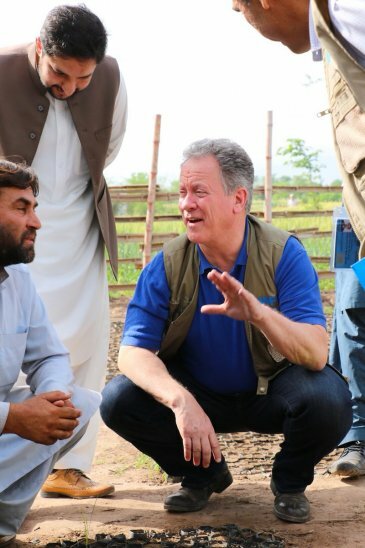 The food aid he received from WFP and the Pakistan government, and then the help building a nursery through the U.N. Food and Agriculture Organization is part of a coordinated effort that needs replicating. As a major player in these types of pro-peace, pro-development policies, Norway is an important strategic partner to WFP. Norway’s work not only saves lives, it helps alleviate suffering and protects civilians affected by war and conflict. Furthermore, the way Norway donates to WFP – it is the 4th largest donor of flexible funds – gives WFP the ability to save money and respond quickly to emergencies. Equally important, these flexible donations allow us to plan for the longer term. Another place these types of policies are showing progress is Niger. Since 2014, WFP has been working with several partner organizations to help more than 250,000 people in about 35 communes, or towns, with a multi-sector approach that builds resilience and stability. More precisely, the programs in Niger cover land regeneration and water harvesting, working with women’s groups to plant tree nurseries and community gardens and school meals through community gardens. The project has expanded land vegetation – up to as much as 80 percent in some areas. That expanded vegetation reduces animal invasion into agricultural lands, an event that sometimes contributes to inter-communal fighting. A concerted, focused effort like this can create stability, the kind of conditions that help a family, a community, a region take care of itself. That must start with food, because nothing else can happen when everyone’s hungry. But it also means schools and water and roads and governance and a dozen other things. One way that’s done now is through a programme we call Food for Assets. We have about 10 million people in 52 countries building roads, planting trees, and working on irrigation, water ponds and other agriculture-related projects. Another key component of this pro-development strategy starts younger – with school children. This program is enormously cost-effective – on average, WFP spends (US) $50 to feed a child in school for an entire year. And for some parents, the food is the reason they send their child to school, because then they’re assured that he or she will indeed get a meal that day. But I think the program does more than that. Children sit down, and talk, and laugh together while eating, and I believe that time helps these children see each other as people. That meal binds them together. And when they’re older, those bonds are harder to break. That’s what Hatem Ben Salem, the Minister of Education in Tunisia, told me last month that reflected on his “warm memory” of his own experience with school meals as a child. “Lunchtime at school offered an opportunity for children from diverse backgrounds, rich and poor, to sit around a table and share a hot meal,” he wrote. Military spending around the world is now at (US) $2 trillion a year. But effective food-and-development programmes create stability that reduces the risk of conflict. And that’s what people in these war zones are asking for. I want Nyalam and her little girl to be able to live, go to school, work their fields and pursue their dreams. If we can help them do that, we’ll truly not just be saving lives, but changing them. And that helps everyone, around the world. David Beasley is the executive director of the United Nations World Food Programme and visits PRIO today to take part in the seminar How Can Improved Food Security Alleviate Conflict? This text is published in Norwegian in Dagsavisen 13 April 2018: “En vei til fred gjennom mat“.